1.) What is the cost? $100 non-refundable application fee per registered child, due upon registration. Families are required to raise $150 during the school year. Fundraising opportunities will be available throughout the year, as well as a flat-fee buyout option. The first tuition payment is due on or before the first day of school. Parents have the option of paying the total up front, or quarterly. Late payments are subject to penalty fees. Tuition may be paid by check, cash, or online via PayPal here. There is a 3.5% fee for paying via PayPal. 2.) What are the age requirements? 4.) How many students in the classroom? 5.) What is the adult to child ratio? 6.) 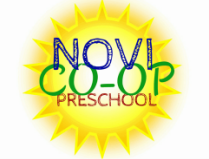 What is the Novi Co-Op Preschool curriculum? Play-based and designed by our experienced teachers to foster social, physical, emotional, and educational development. Our kids have FUN while they learn! Kindergarten preparedness assessed by teachers. Open-ended projects suitable for all skill levels. 7.) What is the Pre-K Extended Day Program? Our Pre-K Extended Day Program is an opportunity for your child to stay for a longer day on Wednesdays, to better prepare them for full-day kindergarten. Children will eat a packed lunch in class, have a rest, and engage in focused instruction that adheres to the Michigan Early Learning Standards. 8.) What is expected as a Co-Op parent? Attend a mandatory Orientation prior to the start of school, typically after Labor Day. Attend mandatory general membership meetings (1-2 evenings per school year). Participate in one mandatory fundraiser (or buyout) per school year. Work in the classroom one to two times a month ~ optional for the 2019-2020 school year. Provide a healthy, nut-free snack for the classroom on your assigned snack day. Fulfill your responsibilities in your assigned committee or position. 9.) What are the security and safety features of your school? All classroom workers are pre-screened through Michigan State Police and Protective Services. Outer entrances are locked during class time as well as interior classroom doors. Children are never left unattended (i.e. bathroom breaks, outdoor play, etc.). Children are signed in and dropped off directly to the classroom. Only authorized family/friends are able to pick up your child during class dismissal. Children are released one at a time to an authorized adult. All teachers, substitute teachers, and assistants are CPR and First Aid Certified. The classroom is a nut-free/allergy-friendly environment. Children wash their hands before entering the classroom each day and before snack time. All parents are provided the opportunity to check the snack each day at drop off for potential allergens and/or sensitivities. We do NOT allow parents to bring their other children into class on their scheduled working days because it would be too difficult to effectively assist the teacher and students with a non-enrolled child in the room. If a family is in need of childcare, we are happy to put them in touch with other families in the same situation. The Co-Op does not provide childcare. We understand! Many children are ready for preschool, but not quite ready for the potty. Our license prohibits us from changing diapers. However, we welcome children who haven't quite mastered toilet training. If your child soils his/her pull-up or diaper, we must call a parent/guardian to school for a quick change.